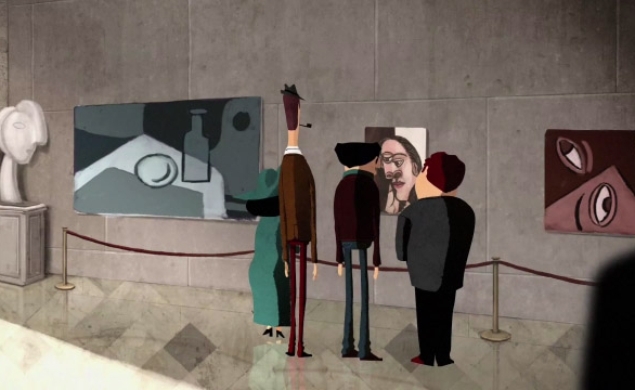 Léo Verrier’s animated short “Dripped” begins like a classic caper film, with Pablo Pico’s slinky, jazzy score punching up scenes of a burglar named Jack swiping famous paintings from New York museums. But then Jack gets cornered by the police, and he responds by taking a bite out of his loot—which turns his face cubist, and baffles the cops. This, it turns out, is Jack’s gambit: He steals paintings so he can eat them, and he eats paintings because then he can become them. And that’s all well and good, until Jack loses access to museums, and has to buy himself some paints and a canvass, to make his own dinner. Verrier is a French animator and commercial artist who made “Dripped” while working for ChezEddy, a Paris company that specializes in advertising, music videos, and short films. “Dripped” played festivals around the world—winning awards at several of them—and made it into the touring 2012 Oscar-nominated Shorts program, even though it didn’t land an actual Oscar nomination. It’s been a popular film not just because it has such a strange premise, but because the premise suggests a deeper meaning. Is Jack’s appetite just a quirk, or is he really getting something out of these paintings, in the same way that a young art student would metaphorically devour everything he saw at an exhibition? That’s not a question that “Dripped” dwells on, but it’s one that becomes more relevant when Jack becomes a painter himself, and he finds out whether he’s really absorbed anything from all those canvasses he’s consumed. The answer to that gives “Dripped” a nifty, unexpected twist—one that suggests that an aesthetic omnivore can’t help but regurgitate something avant-garde.